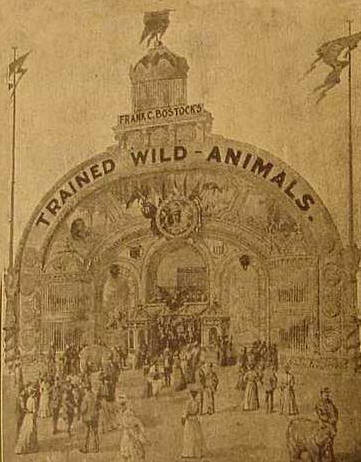 Great Animal Arena Program from 1901. 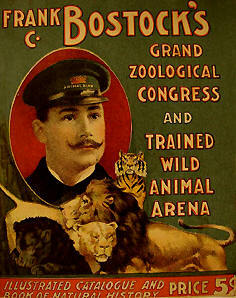 FEW WORDS ABOUT FRANK C. BOSTOCK, THE ANIMAL KING. 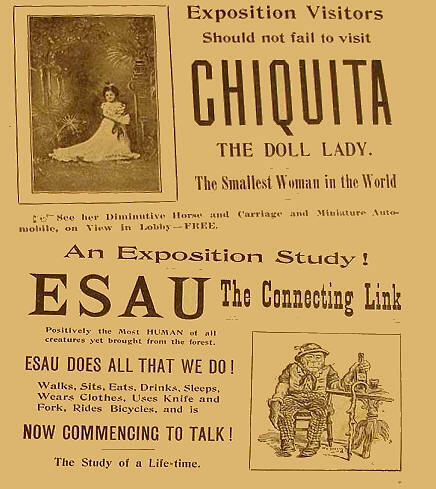 Famous Importer, Trainer and Exhibitor of Wild Beast. The acme of human courage and daring, the apex of architectural magnificence the highest pinnacle of wild animal intelligence and subjugation together with a superlative degree of educational zoological features, are the combined salient characteristics of a world's resources and a lifetime's plucky effort, perseverance and experience as represented to-day by the Great Bostock Zoological Arena, which is without question the star feature of the Great Pan-American Exposition. The effort of other in similar lines at former expositions pale into insignificance beside this mighty enterprise, the fame of which has already extended the world around. In the jungles of Africa, the forests of India and the deserts of Arabia and Egypt, which have been invaded by Director Bostock's agents in search of the rarest and fines of the wild animal creation, is known the name of "The Animal King." 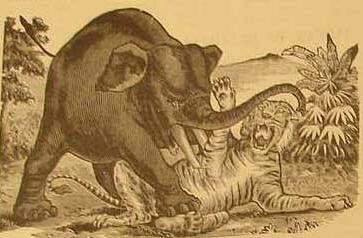 The savage natives of the globe's remotest corners and most inaccessible recesses know of the white man who rules the most ferocious beasts into absolute submission and obedience by some mystic power they cannot understand, which same man stands to-day alone and distinct as the king of all animal subjugators. It was he who only a few week ago, alone and unarmed save with a riding-whip, faced the man-eating tiger "Rajah" at the Indianapolis Zoo. This same tiger had killed and partly devoured a luckless fellow in the same cage only a few weeks before. It was he who at the Atlantic City Zoo, rushed into the arena when seven lions and five jaguars were fighting and drove them apart with nothing but a walking-stick, and it was he who rushed into a cage, in Chicago unarmed and fought a lion with his bare fists away from the prostrate body of a trainer whom he had knocked down and was about to kill; it is he who, despite the agony he suffered from the frightful wounds inflicted by the tiger's claws, forgot his physical pain in his determination to give the visitors to the Pan-American Exposition the greatest animal show they had ever seen, and it is he who, knowing no such word as fail, in spite of all opposition and obstacles, alone opened his show promptly with the great gates at Buffalo, May 1. The building in which the exhibitions are given is without question the handsomest on the Midway. The first impression of those who visit it is one of profound magnitude and admiration. Its exterior is a mass of rare painting, carving and gilding and represents the very highest degree of the decorators' are. It is magnificent beyond compare and reminds one of the extravagant days of ancient Rome. The interior is one of vastness and spotless cleanliness as well as intense interest. Around its sides in their great steel-barred cages are shown the animal creation fully and complete. The entire brute kingdom is there represented, from the ice-bound region of the Arctic Circle to the sun-scorched latitude of the Equator. Mountain, forest, jungle, desert, plain, ice floe and frozen sea have been ransacked to get together this vast collection, in which there is not a single interesting species missing nor one rare variety absent. 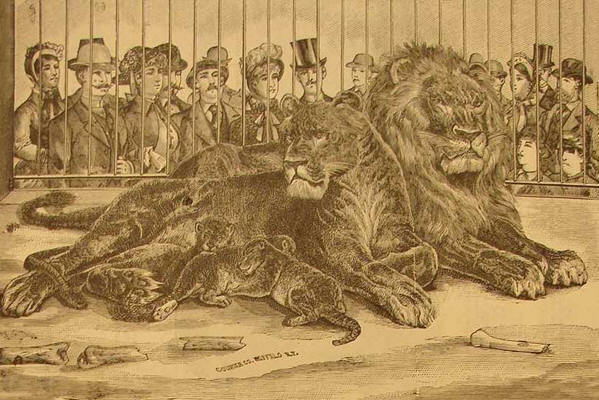 The white-coated polar bear of the Arctic Circle and the sleek, striped tiger of the torrid Bengal are seen side by side with the black-maned lion of Africa and the snowy-fleeced lamb of Persia. The elephant of huge dimensions and the tiny horse no bigger than a little dog are present in striking contrast. Never since Noah launched forth in the ark has there been such a gathering of God's queer creatures under one roof. 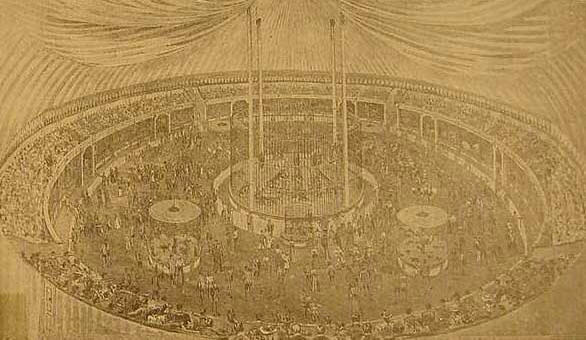 In the mammoth seventy-foot steel arena are shown the crowning features of the exhibition, and even printers' ink-potent as it is among modern powers which influence the public-is not equal to the task of describing the boundless wonders to be seen there. Commanded and directed by the world's greatest lining animal trainers are shown man-eating lions, blood thirsty tigers, treacherous leopards, snarling panthers and huge shaggy bears, grave-robbing hyenas, fierce-fighting wolves and other savage denizens of the wilds of the woods whose mission on earth is to kill and destroy, as well subjugated as household pets. In that great circle of steel are to be seen the most fearless and daring of this world's men and women, taking their lives in their own hands, posing among groups of beasts that are among the most deadly know to civilization. But that is not all. More than mere mastery is shown. Education to a degree bordering closely on the line of human understanding is amply demonstrated, and performances are given which fairly bewilder the sense of the spectators and make them wonder can such things actually be; to ask themselves, is it all actually real or some wild dream. 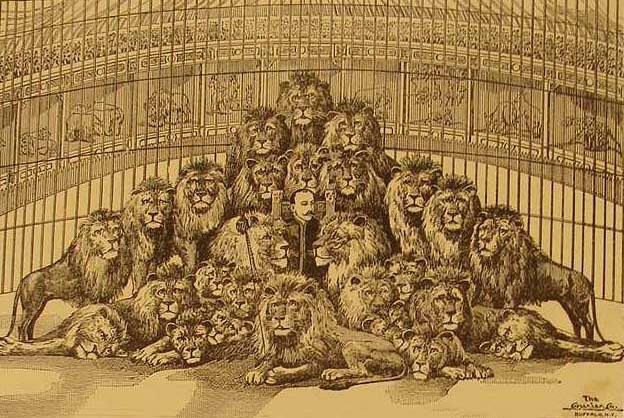 Imagine one man surrounded by twenty-five monster lions, sitting calmly in their midst reading a newspaper, while they group themselves about him as peacefully as kittens around a little child! Picture, if you can, one little woman, small in stature, but a mastodon in courage, amid a dozen or more snarling, sneaking, blood-thirsty leopards, jaguars and panthers, the most dangerous and treacherous of beasts! What could be more daring or courageous in the line of human accomplishments? Splendor, grandeur, magnificence, heroism, morality and refinement of the highest order have ever been the fundamental characteristics of the many Bostock enterprises in the past, but the masterpiece of all is the great Pan-American exhibit In its many phases and colorings it blends as into one superb life painting of real life which has already astounded and delighted a world of visitors. In the foreground of this colossal and magnificent life picture stands out in bold relief in the glorious magnificence of perfect manhood, masterful courage and sublime intelligence, the form of its creator, projector and promoter, the man whose enterprise and accomplishments against adverse circumstances have astounded the amusement world, whose single word of command has brought the forest kings cringing at the feet, FRANK C. BOSTOCK, the Animal King. Honesty, patience, intelligence and heroism have been his means of accomplishment. World-wide fame as a showman and universal respect and admiration as a gentleman have been his well-earned reward. Of the Elephant there are two species, namely, the Asiatic and the African. The Asiatic is much larger and more powerful than the African, and are said to possess much greater sagacity. The Elephant is the largest of all terrestrial animals, and sometimes attains the height of twelve feet. The male only of the Asiatic species, are supplied with tusks, while in the African both male and female possess these implements of defense. The Elephants usually travel in herds, inhabit marshy places, and are know to be excellent swimmers. Excessive heat and cold are alike unfavorable to them. Their sense of smell is very acute, and while apparently clumsy and slow they can, when forced, out-run the fastest horse. The Camel is found in Turkey and in some portions of the Levant. They live on vegetable food, and all the species ruminate or chew the cud. They are very serviceable, and in disposition mild and inoffensive. The Camel has two humps on the upper part of his body, one situated on the shoulders and the other a little behind. A very peculiar fact about the Camel is that they are able to abstain from water sometimes for fifteen days. A large Camel is able to carry a load of from 1,000 to 2,200 pounds. Natives assert that they possess a great share of intelligence. The milk of the Camel is the common food of the Arabians, and its hair is cloth for their garments. The Zebra has large head and ears. Its legs are delicately small, and its body round and plump. The skin is adorned with elegant stripes. In the male the stripes are brown on a yellowish white ground; in the female, black on white ground. These are two varieties of the Zebra order. One is found in the mountainous portions of Northern Ethiopia, Congo, and Cape of Good Hope. The other is found upon the plains of the same regions. The disposition of the Zebra is both obstinate and ugly, but once broken to harness, is just as intelligent as the horse. This animal is a native of Asia, and is found principally in the Himalaya Mountains. The Sloth is a animal treated by Buffon, the celebrated naturalist, as one whose life must be a burden to itself. 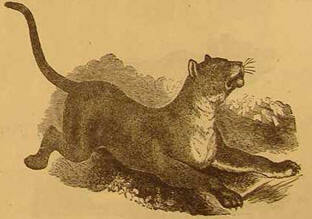 It is of the most uncouth appearance, and is armed with a fearful claws. They are very rare, this one being the only one at present in America. The native region of the Llama is upon the slopes of the Andes, in South America. In Height he is about four feet six inches, and in length from the neck to the tail nearly six feet. Its usual weight is about 300 pounds. In the wild state the hair of the Llama is long and coarse, but when in captivity it becomes short and smooth. The color is white-gray and russet, disposed in spots. In the wild state they are vigilant and shy. When irritated they eject the contents of the mouth on the offending party; the substance discharged is very disagreeable. Four species of the Llama are now acknowledged, namely, the Vicugna, Guanaco, Yamma and the Alpaca. The most peculiar thing about the interesting bovine is the large hump on its shoulders, which sometimes weighs fifty pounds. 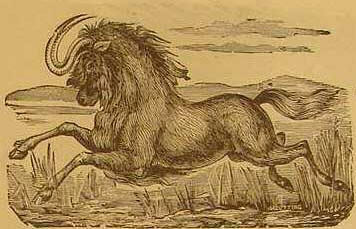 It has a gentle temper, and in many respects resembles the common ox. They inhabit the whole of Southern Asia and Africa from Abyssinia to the Cape of Good Hope. The color is usually a light, ashy grey, passing into a cream color or milk white. 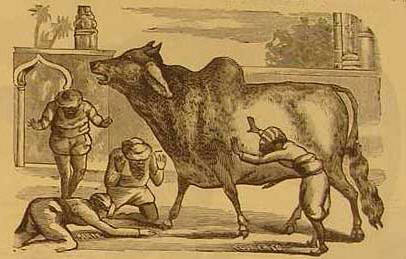 The Zebus bear a charmed life among the ignorant Hindoos, who believe their slaughter to be great sin. However, they do not object to working them. The Anaconda is found in South America. It is not venomous, or has it been know to injure man, but the natives stand in great fear of it, and will not bathe in the water where the Anaconda is known to frequent for its prey, which consists mostly of fish and animals who go to the water to drink. The Dromedary is found in Southern Africa, Egypt, Persia and in Northern India. It differs from the Camel inasmuch as it has but one bump, and is not as large or strong. Like the Camel the Dromedary is constantly forced to kneel to load and unload its burdens. To help this Nature has provided them with thick, callous pads on the knees and shoulders. The toes of the Dromedary are very broad, and furnished with wide cushions, which enables the animal to maintain a firm foothold on the shifting sands of the desert. The Dromedary always is considered by the natives as a Divine gift. The Kinkajou is a native of South America. It is not unlike the coati-mundi in its habits, but is more active. The tongue of the Kinkajou is capable of being inserted into crevices and drawing out any insects that may be lying there beyond the reach of its paws. During the earlier part of the day it will not move, but towards dark it becomes very brisk and animated, climbing about its cage and swinging from the top bars by its tail and hind paws. The Alligator is a native of the warmer parts of America and measures when full grown seventeen or eighteen feet. The voracity of these animals is so great sometimes that they do not even spare mankind. The teeth of the Alligator are as white as ivory; and snuff-boxes, chargers for guns and several kinds of toys are manufactured from them. The flesh of the young animals is said to be white and tolerably good eating, but that of the old ones is, from its strong scent, extremely unpleasant to the palate. 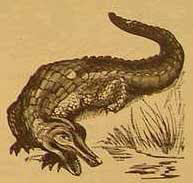 The armor with which the Crocodile is clad may be counted among one of the most wonderful pieces of natural mechanism. The color of the full-grown Crocodile is blackish brown above and yellowish white beneath. The animal is found mostly in Guiana, where the rivers are pestered with vast shoals of them. In the water he seems to enjoy his great strength. Only when hungry will he venture on land and then he only stays until he secures his prey. The Crocodile has no lips and so when either walking or running the teeth are bare and the aspect seems animated with rage. The common or collared Peccary is an inhabitant of South America. It is a small animal, rarely exceeding eighteen inches in height and yet it is not less dreaded than the savage wild boar would be. It is very ferocious and utterly devoid of fear. These animals are found in pairs in the breeding season and at these times very rarely come out of the forest. The female produces only once in the year and the young are generally two and never more. 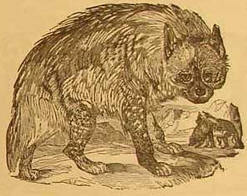 The Hyena is a repulsive looking animal about the size of an American Wolf. It inhabit Asia and Africa. Its color is a dingy grey with a rough, grizzly mane of a black or brown tinge. there are several varieties of this animal, the Striped, the Brown, and the Spotted, sometimes called the Tiger-wolf. 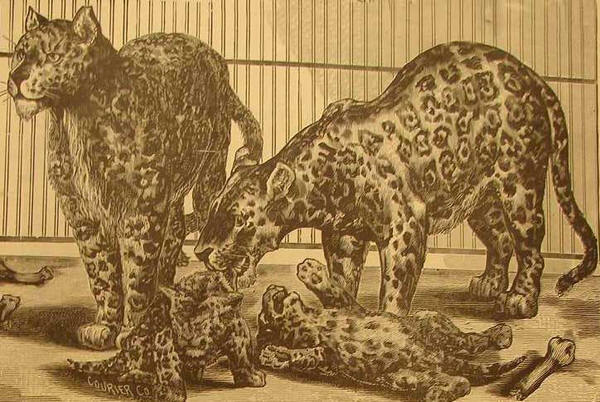 The Hyena was long thought to be untamable, but skilled trainers have lately accomplished wonders with them. The Fox is a native of almost every quarter of the globe, and is of so wild and savage a nature that it is impossible fully to tame him. He is esteemed the most sagacious and crafty of all beasts of prey. The Quagga is a native of South Africa. It bears some resemblance to the zebra, but at once distinguished from that animal by the paucity and dullness of its stripes, which do not reach the hind quarters, except the legs, and only faintly mark the back, its head neck being shy of stripes. 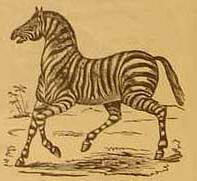 It is not formed quite so graceful as the zebra, the hind quarters being higher than the shoulders. The native occasionally tame it for purposes of draught, but it is not to be depended on. The Badger is not only well known in England but is occasionally found in the temperate parts of Europe. Although in itself a harmless animal, Nature has furnished it with such weapons that few creatures can approach it with impunity. They live principally on fruit, roots and other vegetable food. The general length of the Badger is about two and a half feet, and the tail six inches. Its body and legs are thick the eyes and ears small, and the claws long and straight. the animal is of a uniform grey color above, and the under entirely black. The activity of this reptile is enormous. In speed it will sometimes equal a horse. Their different motions are very diverting. They will at times climb the tree s in quest of tree frogs, or for other prey will glide at full length along the ground. These reptiles are furnished with poisonous fangs. They are confined to the warmer parts of America, where they prey on the smaller species of bats, lizards and insects. They give notice of their approach by the rattle at the extremity of their tail. This rattle is composed of hollow, membranous articulations, that annually increase in number until they reach forty. The head is broad and covered with large corinated scales. 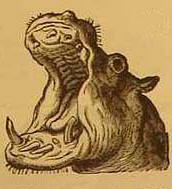 The snout is rounded and obtuse. This is a well-known snake in Egypt, and derives its name from the horny scale over each eyebrow. The average size of the Cerastes is only eighteen inches. The snake-charmers of Egypt use them as their brethren do the Cobra in India. The common snakes are inhabitants of moist and warm woods on the dry banks of which they are often seen in summer basking themselves. In winter these snakes conceal themselves, and become nearly torpid, reappearing in spring, when they uniformly cast their skins. This is a process which they perform in autumn. They are harmless and inoffensive, being totally destitute of any means to injure man. The Virginia Opossum is about the size of a small cat, but from the upright growth of its fur it appears to be much thicker, Its color is dingy white. The legs are short and black, and all the toes (except the interior ones, which are flat and rounded), are armed with sharp claws. The females are furnished with abdominal pouches, for the protection and preservation of their offspring. In some of these there are two and three distinct cavities, which can be shut or opened at pleasure. Hence they are called marsupial animals. The information posted above is not all inclusive of the original booklet, but all information included is from the original booklet.